Wowie! After years of me griping about it, it looks like my prayers may be answered. The Michigan State Capitol Commission wants to put a lawn and a welcome center at the west end of the capitol where that ugly and poorly maintained surface lot currently stands. LANSING – By fall 2017, the Michigan Capitol building could see a new $88 million Welcome Center and a new park on its west lawn in what would be the biggest renovation to the statehouse and grounds in 22 years. 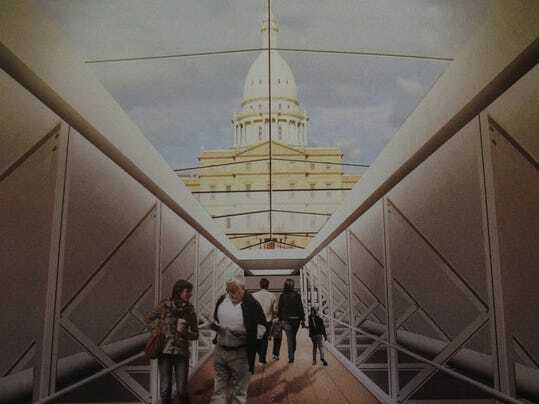 Under the plan announced Tuesday by the Michigan State Capitol Commission, all visitors to the Capitol — there are some 150,000 tourists and schoolchildren who come every year — will enter through the west side of the Capitol off North Walnut Street. They'll enter a new facility that will include a cafeteria, a large committee room, new "education briefing rooms" and enhanced security measures, according to a news release from the commission, which oversees the building. The parking lot on the statehouse's west side will be moved underground and replaced by a park, as envisioned by the 135-year-old statehouse's architect, Elijah Myers. Can't wait to see some exterior and aerial renderings and such. I also wonder how the proposed park between the Capitol Complex and Hall of Justice is progressing? If all of this gets down, we can get surface parking totally off the Capitol Complex so we can concentrate on the blocks south of it. I saw this, it's catching a lot of flack on Facebook. Lol, everyone outside of Lansing, concerned about the use of tax dollars. What I'm trying to figure out from the renderings is whether the Welcome Center is built underground. Wow is right! This is something that has been talked about here before and is something I'd dreamed of, knew made sense, but still didn't expect to see it actually happen. 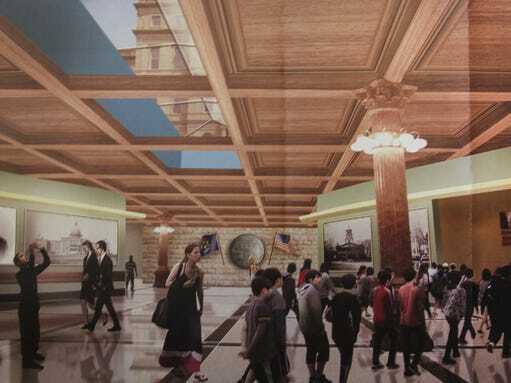 Between this and the proposed park east of the Supreme Court, the Capitol Complex is going to so much more welcoming. It definitely looks like the welcome center will be underground, surrounded by a parking garage on either side with a full floor of parking below. Looking closer, it looks like this project may even include renovating the sub basement as part of the welcome center. Yeah, it appears there will be a skylight running down the middle of the west lawn to let natural light in. I wasn't sure if this skylight will extend above the level of the lawn or be level with it. I'm really interested to see how its all integrated into the new lawn. Looks like there will be a pedestrian entrance, too, underneath the pedestrian bridge that crosses over Walnut to the Capitol Complex. I always thought that it was wasted space that have this hill and not totally develop under it. You already have some of the administrative offices for the capitol built into the hill on the north side of the grounds. Speaking of the basement, I remember being taken down there as a kid during a field trip, but I can't remember what the area was used for. My favorite space in the capitol? The old Supreme Court chamber. It's a relatively small room in the place, but boy is it beautiful. The basement you walk into is more of a ground floor that's almost completely above ground, there's a sub-basement below that, I think it's only about 6' tall, I don't think it's used for mush of anything. 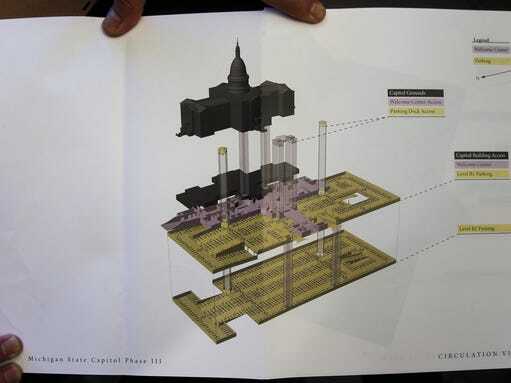 And looking again closer at that last rendering, it definitely shows the new welcome center completely below the Capitol, at the same level as those administrative offices you mentioned and it looks like the lower level of the parking ramp is extending below the Capitol also. This is going to be a nice addition downtown. I would like to see the big lot in front of Michigan Historical Museum filled with residential and retail. such an eye sore and waste of space. especially for a place with such low visitor numbers. I was there this summer and an employee told me funding is so low for the place, a lot of programs and payrolls have been cut. The top floor of library is only used for storage now. Residential and retail/commercial would really help that area. The historical center and library and archives are doing bad, but it's not a result of there being nothing around it, though, I'd loved to see development around it. It's a result of some huge state cuts and restructing years ago during the Great Recession. It's not a local library, it's a state tourist destination. What they need to do to revive it is fund it properly, again (not going to happen with this legislature and governor), and they also need a much more modern and energetic marketing approach for the institution. I don't think so much that a mixed development would help the historical museum/library, but the immediate area. Such a wast of space with the over compensating parking lots. It's a real loser.